Canada’s second largest airline WestJet has eliminated uncertainty over its widebody expansion as 2016 has come to a close, reaching a deal with its pilots that allows the company to move forward in adding Boeing 767 widebodies to its fleet. The latest agreement follows a rejection of an earlier agreement by Westjet's pilots in Nov-2016, which placed in doubt the company’s ability to fully execute its long haul ambitions. At the same time as pilots rejected the previous offer the Air Line Pilots Association (ALPA) was amping up efforts to unionise WestJet’s pilots. Independent entities have attempted to unionise the airline’s pilots in the past, but ALPA’s scale and resources offer a different level of heft to a potentially unionised workforce at WestJet. Although WestJet can now move forward in crystallising its long haul strategy, the threat of unionisation among the company’s pilots and flight attendants looms large, and the airline could be a prime target for larger, more powerful unions. WestJet marked a significant milestone in 2016 when it launched flights to London Gatwick in May. It was new territory for the airline, which serves a number of US and Caribbean destinations, but the company decided to add a third fleet type with its direct launch of long haul service. The airline has tested the waters on service to Europe in 2014 and 2015 – operating its 737s from Toronto with one-stop service to Dublin through St Johns, and to Glasgow with a stopover in Halifax. The addition of widebody jets joining Bombardier Q400s and Boeing 737 narrowbodies was a natural progression for WestJet. Its rival Air Canada dominates long haul capacity from the country, and no real low cost provider operates direct trans-Atlantic flights from Canada. Competition is growing too; the Icelandic low cost airline WOW Air recently announced plans to increase connecting service to Toronto and Montreal from London Gatwick via Reykjavik in May-2017. WestJet’s seasonal fights to Gatwick include service from Vancouver, St John’s, Edmonton and Winnipeg, and the airline operates year-round services from Calgary and Toronto. Data from CAPA and OAG for the week of 26-Dec-2016 to 1-Jan-2017 show nearly 6% of WestJet’s ASMs are deployed to Western Europe. 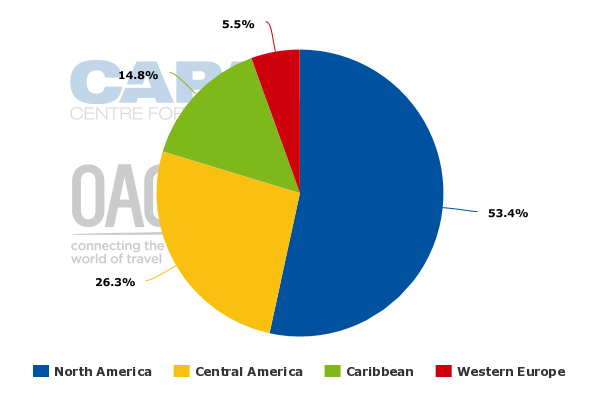 But WestJet only represents approximately 3% of seats deployed from Canada to Western Europe, while Air Canada holds a 48% share. Schedules data is supplied by OAG and is updated weekly. WestJet’s debut in the trans-Atlantic long haul market was marred by operational disruptions driven by problems stemming from maintenance performed on the four previously owned 767s to prepare the jets for the Gatwick service entry. It took WestJet two months to iron out the service disruptions, and the airline faced cost pressure as a result of the mechanical issues with the aircraft. The company is projecting a rise in unit costs excluding fuel for 2016 of 2.5% to 3.5%, versus previous estimates of an increase ranging from 0.5% to 2.5%. In order to allay some investor concern over WestJet’s foray into the London market as the airline faced unit revenue pressure, WestJet management downplayed the risk of its long haul aspirations, casting the effort as a “throw-away” experiment. Similarly to many North American airlines, WestJet has faced unit revenue pressure during 2016, with its performance in that metric falling 5.8% year-on-year in 2Q2016 when it launched the new long haul service. Company executives later expressed some regret about those sentiments, concluding that the comments had triggered capacity additions by its competitors, including Air Canada, which launched its own flights to Gatwick through its low cost subsidiary rouge. Despite the competitive capacity pressure WestJet expressed satisfaction with its performance on the long haul routes, noting that the performance had met the company’s goal of being accretive during the first year of operations. In late 2016 WestJet also declared its operations to London Gatwick were far beyond the experimental stage, and advised that it was holding discussions with its pilots to facilitate growth of its long haul service. In Nov-2016 WestJet’s pilots rejected an agreement that would have allowed management to expand its fleet of four Boeing 767 widebodies. According to the news outlet The Financial Post the proposed agreement included an increase in hourly pay, and higher rates for widebody pilots, but also included a provision to convert stock options to base pay. The publication reported the rejection of a second agreement that allowed pilots to retain stock options but only offered more pay to those operating widebody jets. Near the end of Dec-2016 WestJet declared its nearly 1,400 pilots had voted in favour of expanding widebody operations, but it offered no details of the agreement. The airline did state that it now had the ability to add new long haul destinations and expand its widebody fleet beyond the four 767s it currently operates. Orders include those placed directly by the operator and by lessors assigned to the operator, from 28-Dec-2016 onwards. *Note: WestJet Encore operates 34 Bombardier Q400 turboprops. It is not clear whether WestJet’s newfound ability to expand its long haul flights marks a turning point in the rocky relationship it has had with pilots during the past couple of years. Pilots attempted to unionise under the WestJet Professional Pilots Association in 2015, but ultimately the effort failed. Now ALPA has stepped in to rally WestJet pilots to unionise. The effort could gain considerable momentum, given the union’s vast resources. ALPA has a large budget to dedicate to convincing prospective members of the benefits of a unified collective bargaining body. ALPA marked a major victory in 2014 when the pilots at the US low cost airline jetBlue voted to join the union. Its pilots had rejected two previous efforts by ALPA to unionise the work group in 2009 and 2011. WestJet has undertaken significant business model changes during the last four years including the creation of its regional subsidiary Encore and the launch of trans-Atlantic long-haul flights. From a product perspective, WestJet has introduced a tiered fare structure that includes a premium economy section of its aircraft. During a soft rollout of its extended legroom product in 2013, WestJet’s flight attendants encountered challenges in their work as passengers were confused about the new product. WestJet’s flight attendants have also attempted to unionise with the Canadian Union of Public Employees (CUPE) during the past couple of years, organising a union drive in 2013. In late 2016 another drive was emerging among the company’s flight attendants. The renewed efforts to unionise two of WestJet’s largest employee groups are likely a result of prospective changes in labour laws. Under a new law that took effect in 2015 – in order to form a union 40% of workers in an employee group have to sign a card and then a secret vote is held. A new law is being considered by Canadian legislators that would eliminate the secret voting process and require 50% plus one employee in order to achieve union certification. WestJet’s business model changes during the past four to five years have been rapid and significant, creating a certain uneasiness among the company’s employees. Although WestJet’s management has attempted to allay concerns about the changing dynamics of its business, the company is a juicy target for some of North America’s largest airline unions. WestJet’s ability to forge an agreement with its pilots to allow for further widebody expansion is a welcome and positive sign, but efforts by employees to rally under the umbrella of a formal collective bargaining body seem to be gaining strength, and a union presence on the airline’s property in the future appears to be a distinct possibility. That would be unlikely to help WestJet's expansion plans.